OK! magazine's circulation had the biggest year on year fall among women's titles in the second half of 2016, dropping 31.4% to 189,270. Although it was a better picture period on period, in which the Northern & Shell title grew 7.3%, the latest ABC results have revealed. 167,130, or 90.4%, of the issues were actively purchased. Look, which is published by Time Inc, fell 22.2% year on year to 88,894 copies, and fell 1.7% period on period. It had 77,844 or 87.5% actively purchased titles. Dominic Williams, chief trading officer for the commercial team at Amplifi, explained that the weekly market has struggled and a lot of the online traffic is going to MailOnline. He said: "There’s a lot of magazines out there and I can’t see one positive number. It’s surprising that the digital numbers are not increasing as much as they should be." Among the glossy monthlies, Conde Nast’s Glamour had the biggest fall in circulation at 25.6% in the last six months of 2016. There were 260,422 copies distributed in the second half of last year, of which 248,329 or 94% were actively purchased. 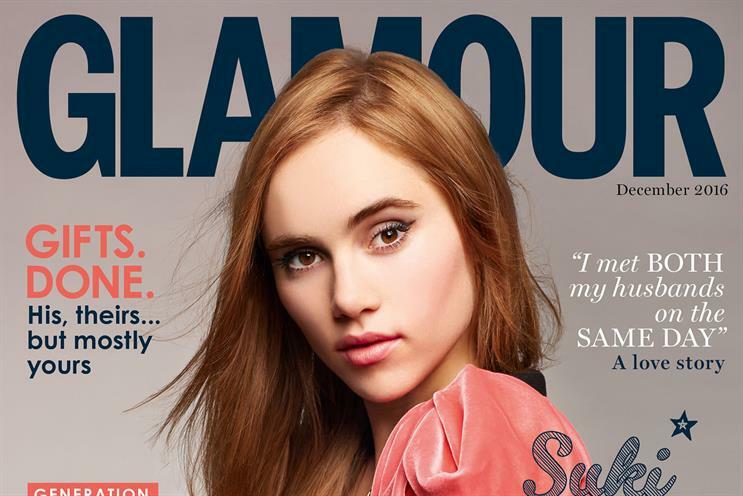 Glamour relaunched last month, dropping its handbag size and repositioned as more of a luxury title. The impact of this will be shown in the next ABC report due in the summer. Camilla Newman, the publishing director for Glamour, said: "Glamour has already addressed the results of the last period, and is reversing the situation. Early epos data for the February issue, the first under the new strategy, shows a strong increase, putting the brand firmly where it needs to be." Rival Cosmopolitan, which is published by Hearst Magazines UK, grew circulation slightly by 0.6% to 407,622. However 77.5% or 306,785 were actively purchased. This means that 100,837 copies were given away for free. The publisher said: "The brand [Cosmopolitan] continues to reap the benefits of Hearst’s dynamic distribution strategy, which puts the magazine directly into the hands of its audience through a tightly targeted mix of channels." Williams added: "It’s a challenging and disappointing market for magazines. Media owners will need to look at their content, and how it is packaged. Is digital going to be the saviour?" He thinks there will be more magazines closing this year. Justine Southall, managing director for fashion and beauty at Time Inc, said that the market is rapidly changing as publishers look at different distribution strategies. Time Inc’s Marie Claire announced this morning that it will be giving away free copies for customers at its beauty shop Fabled by Marie Claire. The title reported a 12.8% drop in circulation to 144,393, with 84.1% or 121,529 actively purchased. In October last year, the publisher closed InStyle magazine, and aims to grow 200% online in the UK in 2017. InStyle is no longer registered with ABC. Stephen Quinn, publishing director for British Vogue at Conde Nast, said that Vogue had a "fantastic bounce" over its centenary year with front covers featuring the Duchess of Cambridge, Cara Delevingne and Victoria Beckham. Vogue’s total circulation was flat year on year, and period on period, at 195,083. There were 131,289 or 82.2% that were actively purchased. Quinn added: "Vogue has had a good result in a market that is tough. But all in the garden is not rosy." He added that the luxury titles sector remains strong and is "healthy for advertisers" that want to sell high-end products. Quinn said that magazines are feeling the impact of uncertainty after the Brexit vote but "as long as publishers approach their business with conviction" things will improve. Quinn and Southall pointed to the increase in bulk copies distributed by Elle, the Hearst title. Elle grew circulation by 2.4% year on year to 168,741, however this fell 1.8% period on period. There were 60.7% or 93,122 titles that were actively purchased. This means that 75,619 were given away for free. Yesterday Duncan Chater, the group revenue officer at Hearst, wrote that the publisher calls this strategy "dynamic distribution" not "bulks" because the latter "is a pretty grim word and conjures up sad images of unwanted free copies". He wrote: "Research shows 20% of those consumers reached by dynamically distributed copies of Cosmopolitan, were new readers. So we’ve brought new women into the magazine, as well as lapsed readers. "This has helped Cosmopolitan increase its circulation by over 59% to become the highest circulating women’s glossy magazine, thus maximising reach for advertisers." Williams added that media agencies will be "watching the bulks".